This church is in the heart of Detroit’s Corktown neighborhood. I have no particular connection to the church itself, but the neighborhood has special meaning to me. My ancestors from Ireland — Protestant and Catholic — settled there over 100 years ago, and my grandmother was born either on the edge of or just outside of the Corktown neighborhood. 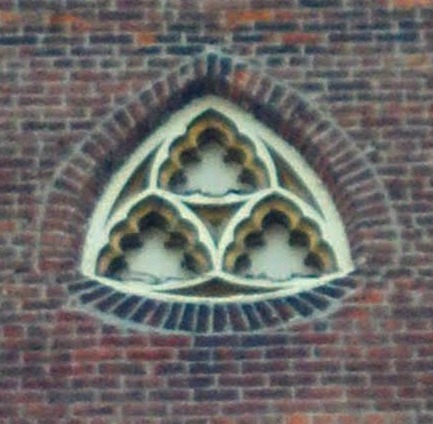 In fact she grew up on Porter, the same street on which this church is found. Corktown is also the place of many great memories for me as it is the home of the former Tiger Stadium. 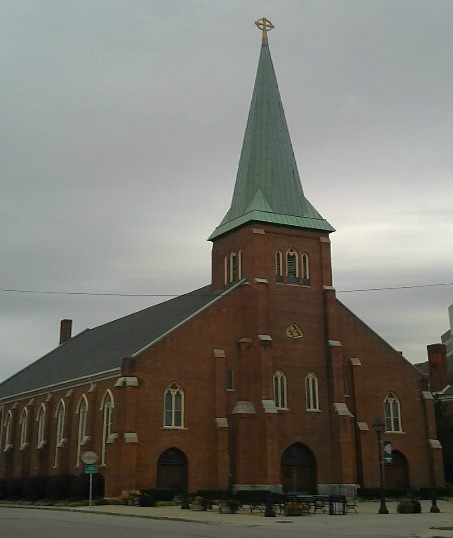 Most Holy Trinity, founded in 1834, was the first English-language Roman Catholic parish in Detroit. The earliest parishioners of the church were Irish immigrants who had settled in the area, but had attended nearby Ste. Anne Church, the city’s French-language parish. Unable to obtain an Irish priest, Bishop Rese appointed a German, Father Martin Kundig, to organize the parish. Father Kundig’s skills were put to the test as the city faced a cholera epidemic that began in 1832, and the first Most Holy Trinity Church was converted into a hospital. During the epidemic, Detroit lost one of its most important early religious leaders, Father Gabriel Richard. In 1835, Father Bernard O’Cavanaugh, the first Irish priest was assigned to Most Holy Trinity. The neighborhood surrounding Most Holy Trinity is known as Corktown, the county in Ireland from which most of Detroit’s Irish immigrants came. As the Irish became increasingly assimilated into Detroit’s larger culture and moved into other areas of the city, Corktown became home to a variety of ethnic groups, including Maltese, African Americans, and Mexicans. To meet the needs of the growing Mexican population in the area, the archdiocese assigned a priest to the parish who would become identified with it for decades–Father Clement Kern (1907-1983). Under Father Kern, Most Holy Trinity became a major center for Latino American residents in southwest Detroit.